North Korea held a massive military parade highlighted by intercontinental ballistic missiles in its capital on Thursday, just one day before South Korea hosts the opening ceremony of the Pyeongchang Winter Olympics. 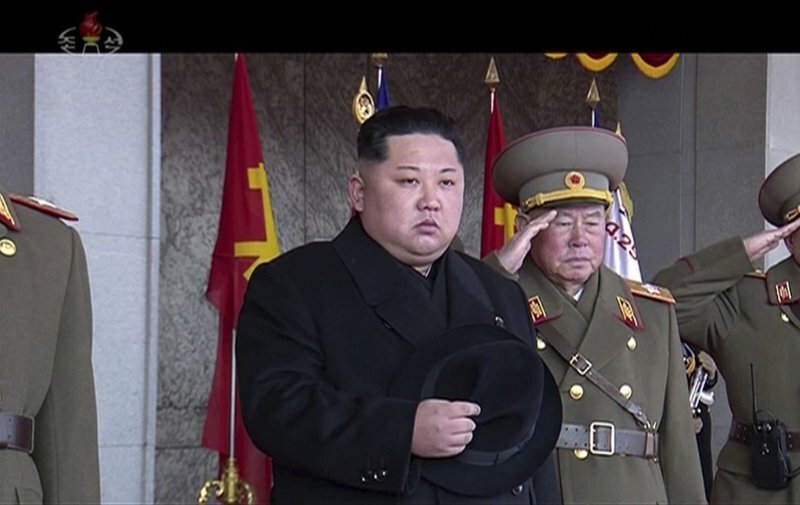 Kim Jong Un, dressed in a long black winter coat, was shown walking on a red carpet with his wife at the beginning of the event, which North Korea’s state-run television broadcast hours after it was over. It began with thousands of goose-stepping troops lined up in Kim Il Sung Square to form words and slogans. Later, North Korea displayed its most powerful strategic weapons, including what appeared to be Hwasong-14 and Hwasong-15 ICBMs rolled out on launcher trucks. 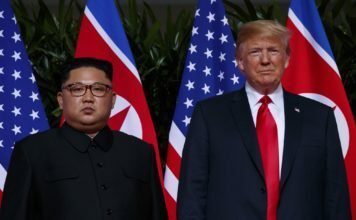 Analysts believe the missiles, which were successfully tested last year in three launches, could potentially reach deep into the U.S. mainland when perfected. Virtually all foreign media were excluded from the event. 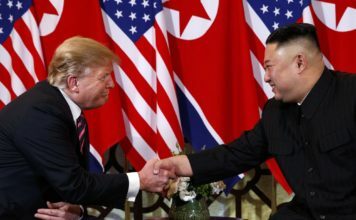 “As long as imperialism remains on the Earth and as long as the United States’ hostile policy on North Korea continues, the mission of our military, which is to protect our country and people and secure peace, can never change,” he said. Kim didn’t make any comments about the Olympics in the parts of his speech that were broadcast. The coverage of the parade seemed heavily edited. North Korea had said it would hold a big event to mark the 70th anniversary of the founding of its military. Feb. 8 has been seen as a less important founding anniversary but made something of a comeback in 2015 and was elevated further this year in part because it is the 70th — a nice round number. The parade also featured tanks, armored vehicles, jets flying over the square in formation to make a “70,” and thousands of people dressed in red, white and yellow creating the letters “Kim Jong Un” in Korean and the ruling Workers’ Party’s symbol of the brush, hammer and sickle. The North also rolled out what appeared to be a Hwasong-12 intermediate range missile, which it flew over Japan twice last year as it stepped up the aggressiveness of its weapons tests. The Olympics probably were also a big factor in North Korea’s decision to hold the parade. Kim Jong Un has gone out of his way to make sure the North will hold attention throughout the games. Following a last-minute proposal during Kim’s annual New Year’s address, North Korea is sending 22 athletes to compete in the Olympics and a delegation of more than 400 musicians, singers, martial artists and members of a cheering group to the games. Kim is also dispatching his younger sister, Kim Yo Jong, to attend the opening ceremony. That in itself is a major development — she is one of his closest confidants, holds a senior party position and her trip would mark the first time any member of the ruling Kim family has visited the South since the Korean War. She will meet South Korean President Moon Jae-in at a luncheon, Moon’s spokesman said Thursday. The North’s conciliatory moves related to the Olympics have generally been welcomed in the South. The parade, however, was seen as more sensitive. The North unveiled five new kinds of missiles at its most recent major military parade last April. Talmadge, the AP’s Pyongyang bureau chief, reported from Pyeongchang, South Korea. Follow him on Twitter and Instagram: @erictalmadge.